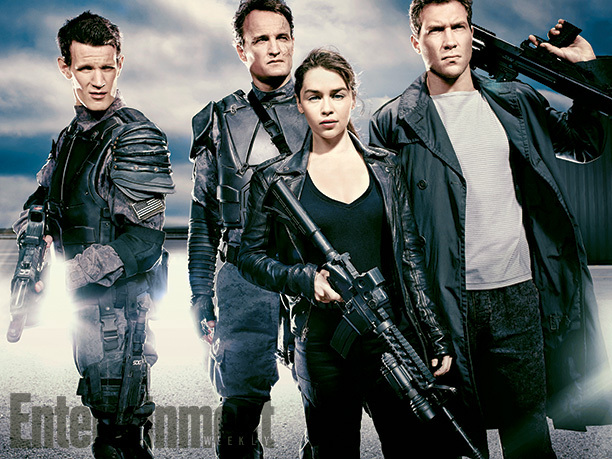 Fans got the first batch of photos from Terminator: Genisys in a new Entertainment Weekly article. This reveal great first looks at Emilia Clarke as Sarah Connor, Jason Clarke as John Connor, Jai Courtney, Matt Smith and Arnold Schwarzenegger who returns as the Terminator. The article also gives fans a glimpse at the story, which is “set in 2029, when the Future War is raging and a group of human rebels has the evil artificial-intelligence system Skynet on the ropes. 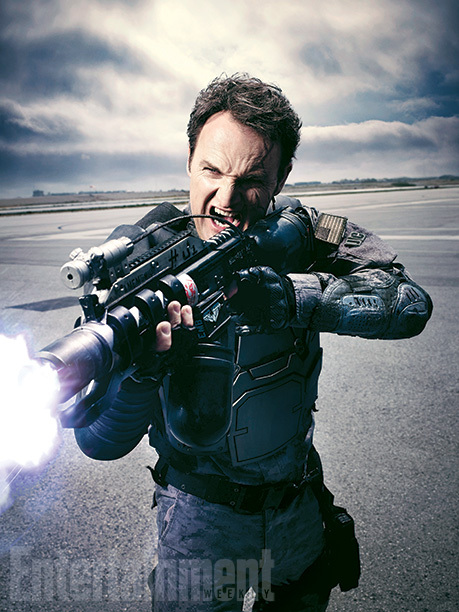 John Connor (Dawn of the Planet of the Apes‘ Jason Clarke) is the leader of the resistance, and Kyle Reese (Divergent‘s Jai Courtney) is his loyal soldier, raised in the ruins of postapocalyptic California. As in the original film, Connor sends Reese back to 1984 to save ­Connor’s mother, Sarah, from a Terminator programmed to kill her so she won’t ever give birth to John. But what Reese finds on the other side is nothing like what he expected,” as explained in the EW article. 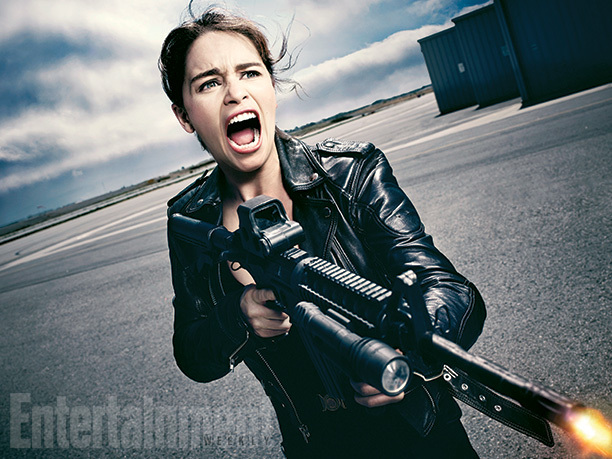 This is the first film in a new trilogy and the photos show Emilia Clarke as a gun toting Sarah Connor in the film directed by Alan Taylor (Thor: The Dark World) and written by Laeta Kalogridis (Shutter Island) and Patrick Lussier (Drive Angry), as Genisys sets out to take basic elements of the original 1984 film and rework them in striking new ways. Sarah has been raised by Schwarz­enegger’s Terminator, an older T-800 she calls “Pops,” who is programmed to guard rather than to kill. Sarah is a highly trained “antisocial recluse who’s great with a sniper rifle but not so skilled at the nuances of human emotion,” the article says. Jai Courtney confirming that his character, Kyle Reese, will have a romantic storyline with Sarah. The article recounts the long and failed history of the franchise and Arnold speaks about his return. This article appears in Entertainment Weekly‘s Nov. 7 issue. 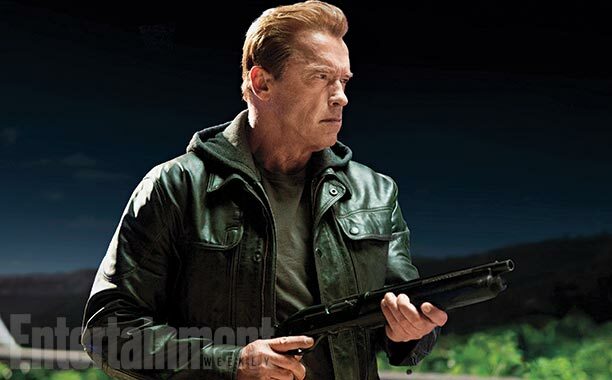 Terminator: Genisys will open in on July 3, 2015.